I must apologise to those of you who have been awaiting my tea party report with bated breath (that would be all two of you then!). I meant to do this last Monday, but work and life and things got in the way and I just couldn’t find the time. But better late than never as they say! So, a quick recap for those of you who’ve forgotten (or just don’t know) what I’m going on about. My wonderful blogging friend Katy (whose blog you can find here) is raising money for The Foundation for the Study of Infant Deaths, in memory of her friend Michelle’s baby boy Keelan. Katy is raising money by hosting tea parties… and having other people host tea parties for her. Could there be a better way to raise money than by eating cake?! Clearly there could not! Which is why I had to get in on the action and host my very own tea party. I went for an afternoon tea type event. The entire German-speaking world seems convinced that we Brits drop everything at 5pm every day and sit down for a cup of tea and a scone. I have no idea where they get this from! I’m sure most of us would love this to be the case, but do any of you know anybody who actually does this? No? Thought not. Netherless, I decided to keep the cliche going and have people round for tea (and scones and cake and little traingualr sandwiches) at 5pm on 9th July. I got up nice and early and started cutting teapot shapes out of colourful paper. 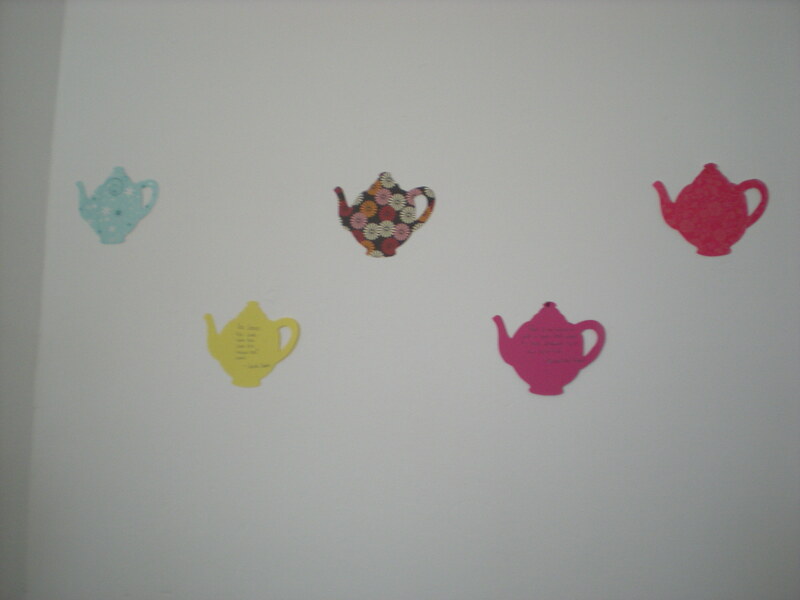 You can’t actually see from the picture, but the non-patterned shapes have tea quotes on them. 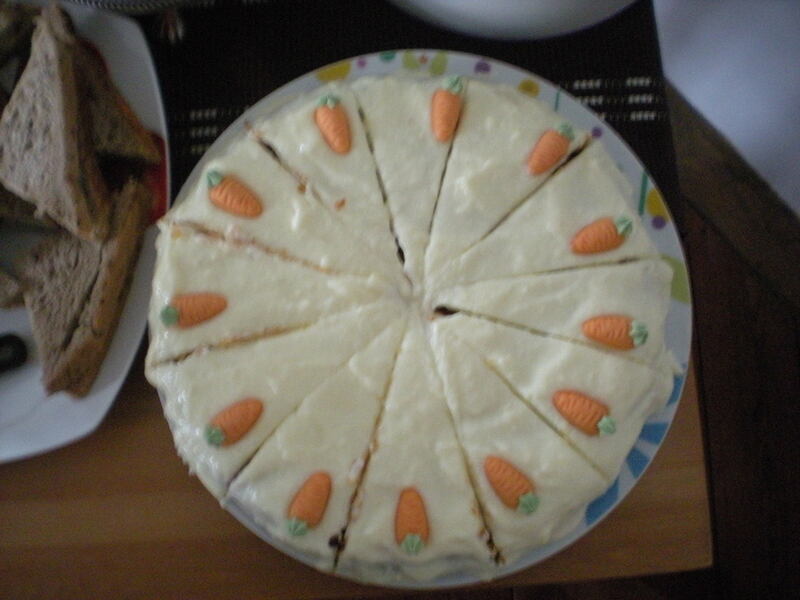 Having decorated the living room to my satisfaction I headed to the kitchen, where the carrot cake I had made the night before was waiting to be iced. The Yorkshire Parkin I had baked the week before was still waiting in its tin. Amazingly we had both managed to avoid eating any of it – despite the fact the Parkin is my absolute all-time favourite cake. I love it even more than the richest and most deliciously gooey of brownies – and that’s saying something! I was secretly hoping people wouldn’t be too keen on it so there would be lots left for me, but (alas) it went down rather well. In fact, I saw one guy take three pieces. Success! The donations tin was placed prominently next to a plate of melon (a contribution from a guest) and, to my surprise, instead of taking the opportunity to get rid of a few coins almost every guest put in a note! We ended up with 76 euros in the tin. Add to that a donation each from Jan and myself, plus the fiver someone who couldn’t make it gave me a few days later and I was able to transfer 95 pounds to Katy’s just giving page! Much more than I was expecting! And I received more compliments on my baking skills on that one day than I have in the entire rest of my life. 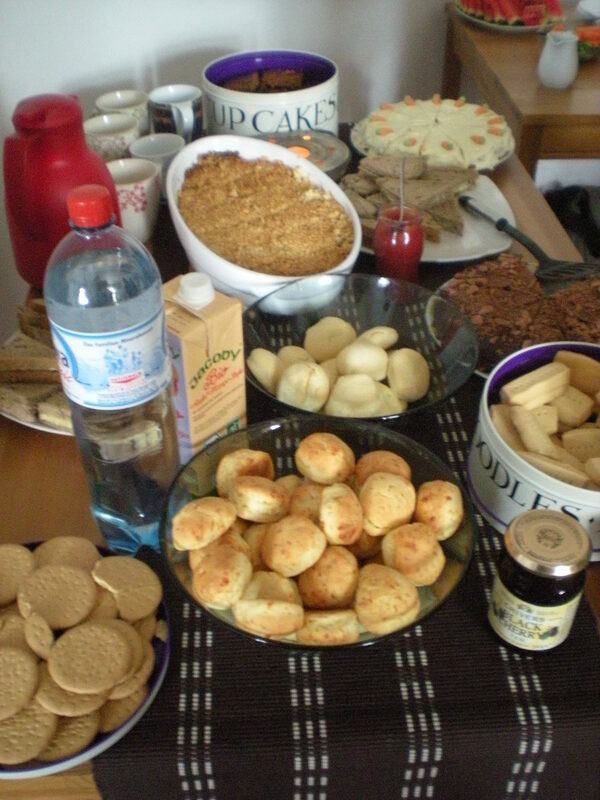 Conclusion: The tea party was a resounding success! I am stupidly tired this evening, having only got about 4 hours sleep last night and about 5 the night before. I kept having to go to the loo and splash water on my face at work to keep myself awake. But instead of collapsing into my bed as soon as I got home (which is what I would have liked to have done!) I went ahead with my original plan and made shortbread dough. The first batch is in the ovrn right now – another ten minutes and I can take it out, then it’s bed time for me! The remaining dough is in the fridge, awaiting it’s turn to be baked. That will happen tomorrow. At 40 minutes a time there’s no way I’m doing any more tonight. My bed is calling! Parkin was mae on Sunday. It’s sitting in a lovely tin, and both of us have managed to resist munching on it. This is very impressive, considering it’s my favourite cake and Jan usually can’t be left within a mile of sweet stuff without gobbling it all up. The amount of times I’ve bought biscuits only to find none left when I come to get one is a testament to this! The things we’re willing to do for a good cause 😉 After work tomorrow I’ll be heading in to town to stock up on ingredients for the rest of my baked goods, then more baking shall be done on Friday. It’s all coming together nicely. Now I just have to hope everyone who’s confirmed actually turns up, otherwise we’re going to be living on cake for the next month! Right, I’m off to get the shortbread out of the oven. Then it’s time to sleeeeeep. Jan can put the biscuits in their tin when he gets back from choir – they should be cool by then. After days and days of weird, wintery, can’t-make-it’s mind up weather, with rain one minute, then five minutes of sunshine followed by wind and rain again five minutes later, the sun decided to come back out in full force today. It has been boiling! Too hot for me – as we all know, I get sunstroke at the drop of a hat. I’m definitely a Spring kind of girl! (I do like snow, but winter gets depressing after a while with all its dark nights). It was hot enough in our office, with the fan going full blast, but once I got outside it was so much worse. I had to go into town anyway though, then I had to slave over a hot stove making tea for myself and the boyfriend. Naturally he is not home yet, and his half is still sitting in the kitchen waiting to be reheated. Luckily that task will fall to him – I don’t fancy spending any more time near sources of heat today! My charity tea party plans are coming together. I’ve actually managed to find a free date for it now, and a few people have already accepted the invitation so there’s no going back! It shall be on 9 July. Now I just have to complete my list of foods and get on with the baking! 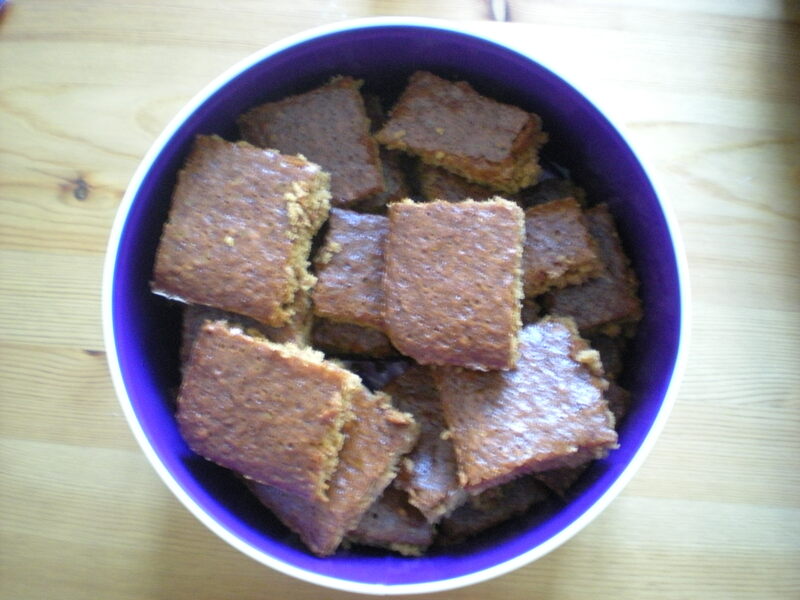 I’m going to start by making Yorkshire Parkin a week before – it actually gets better if you leave it in an airtight container for a couple of days so there’s no risk of having ruined cake on the day. Although it will require a lot of willpower to stop myself from eating it all! Perhaps I’d better make extra… By the way, those don’t know what I’m talking about should read this post then go over to The Dormouse’s Last Stand to find out how to host their own charity tea party for a rather excellent cause, namely The Foundation for the Study of Infant Deaths. That’s all for today. I have some work that needs to be done before I go to bed.